Innovative programs can help a vulnerable population stay healthy. Melissa Miller, manager of Common Good City Farm in Washington, D.C., knew that her organization’s new intergenerational gardening program would transform seniors’ relationships to food. She knew the program would provide seniors with fresher produce, a chance to exercise, a sense of community, and better overall physical health. She didn’t anticipate, though, that it would also bring back memories. The Boulder-based Growing Gardens, is seeing similar results. As part of its Horticultural Therapy program, the organization has partnered with an assisted living home for seniors with dementia to provide gardening classes. The classes involve indoor activities like making lip balm from beeswax and occasional outdoor trips to the home’s own gardens. Community gardens in urban or low-income areas have been heralded as a way to increase the physical health of residents for whom fresh fruits and vegetables aren’t easily accessible. But non-profits like Miller’s are finding that when it comes to seniors, physical health benefits are just the beginning. The growing trend of community gardens that cater specifically to seniors also provides a more holistic approach to healthy living for one of America’s most vulnerable populations. While easing mental health challenges is important, greater access to healthy food is still the main focus of these organizations—and with good reason. In 2013, 9 percent of households containing seniors and 9 percent of seniors who lived alone experienced food insecurity, according to Feeding America. And it’s not just a price issue; health problems and a lack of transportation mean that many seniors can’t reach markets and other sources of food, let alone afford to prepare their own fresh meals. To assuage the access issue, organizations like Common Good City Farms are partnering with senior wellness and retirement centers to build gardens directly on center grounds. This past October, Miller reports that her organization built two gardens with raised beds that are accessible to people with limited physical abilities at D.C.-area senior centers. 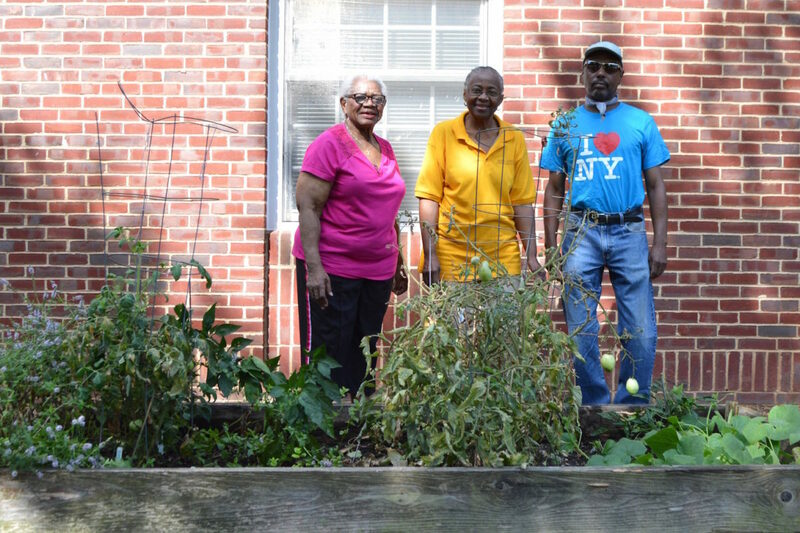 Even when urban gardening organizations aren’t partnering directly with senior centers, they increasingly have seniors in mind. Reehl reports that Growing Gardens made sure that most of the 12 community gardens that the organization manages are located along popular bus routes, so that seniors without cars can get to them easily. The few gardens that aren’t along bus lines are near community recreational centers, where senior groups often rent out plots. For Barbara Owens, a member of D.C.’s Model Cities Senior Wellness Center, a feeling of pride is gardening’s greatest reward. Model Cities is one of the senior centers with which Common Good City Farm partnered, and Owens says that she visits the center’s new community garden once or twice a week. During her recent yearly physical, Owens says she got high marks from her doctor—which she credits to her renewed interest in gardening and learning new healthy recipes during the wellness center’s weekly nutrition classes. Creating welcoming spaces for seniors to garden doesn’t come without some stumbling blocks. Miller reports that some seniors were initially unwilling to participate because they doubted their own skills. To temper their concerns, Common Good representatives started attending the wellness centers’ nutrition classes to encourage discussions about gardening. In Atlanta, Tucker says the main impediment to the ARC’s gardening program success was governance. “Not everyone’s going to agree on things—the how, the what, the who’s in charge,” she said. To this end, Tucker said her agency provided exhaustive training on not only how to start a community garden, but how to form a planning committee, run a club meeting, and manage conflict. Today, Tucker says that nearly all of the community gardens the ARC helped start in 2011 are flourishing—and all are doing so on their own. This seems like an awesome way to get seniors not only eating healthier - but also up and out and active in the community. I think people are more inclined to be physically active and get regular exercise when they feel like they're accomplishing something - and in your older years, that exercise is more important than ever before. I wish this idea were in place in more cities around the US.